Traction pads are fairly self-explanatory. They sit near the tail of your surfboard and help you figure out where your foot placement is at all times while riding the wave. All traction pads are made out of Thermoformed EVA, but differ in textures, shapes, colors, arch contours and kick profiles. 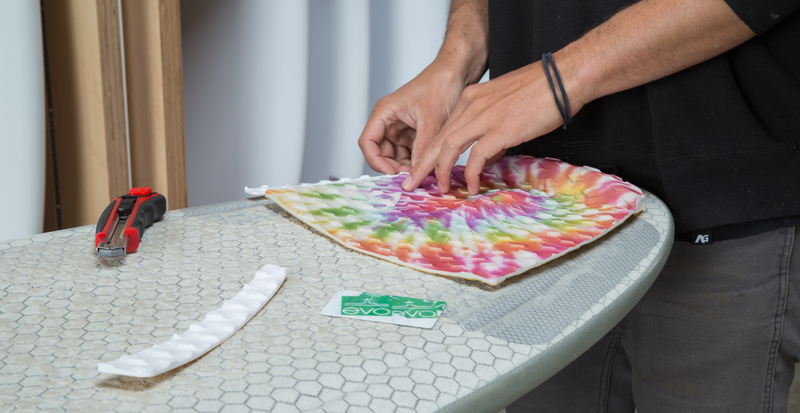 Traction pads are used on almost all shortboards, and are chosen almost entirely based off of personal preference and what feels comfortable to the rider. You'll need a traction pad, a card or scraper, a utility knife, a rag, and a blow dryer if it isn't warm and sunny out. 1. Clean the tail of the surfboard. If it is a new board it should still be wiped with a towel to ensure there is no fiberglass dust from the manufacturer. If there is wax on the board, set the board in the sun for a few minutes to heat up the wax (this can also be achieved by pouring hot water over the wax, or using a hair dryer on the Low setting). Use a comb or a plastic card to scrape the wax clean from the board. Finish this process off by cleaning the area off with a rag. Use a little wax remover if necessary. 2. Place the traction pad down on the board in the desired location. Remove the traction pad from the wrapping but do not remove the backside cover. Using the stringer as a center reference point, set the pad down on your ideal board placement point, with the backside glue still concealed. Most surfers either place their pad directly in front of the leash plug or line it up with the front, center or back of the rear fin. This is a matter of personal preference and where you anticipate your back foot will be living on your tail. 3. Lightly trace the outline of the pad with a pencil. 4. Sand the area where the pad is going to be placed (optional). 5. Slowly peel back the paper That Protects the traction pad's glue and place within the pencil outline. As you can see from the animation, start with the front of the pad and slowly work your way towards the tail of the board, peeling the paper back as you go and pressing down firmly when you are happy with the pad's location. Press from the center out to the edges to prevent air pockets from forming. In a perfect world let it sit for 24 hours before paddling out, but if the waves are pumping, one should note that this step HAS been bypassed by yours truly without negative consequences.